Share a time when you have caught your pet being naughty for a chance to win your choice of a month's worth of BIOpet Supremium dog food or BIOpet Grain Free cat food! 2 to be won. Entries via Facebook only. Terms and conditions: This is a game of skill. Chance plays no part in determining the winner. Open to Australian residents only. Starts 11am 17/7/16 and ends 11:59pm 25/7/16. Winners announced 3:30pm 26/7/16. 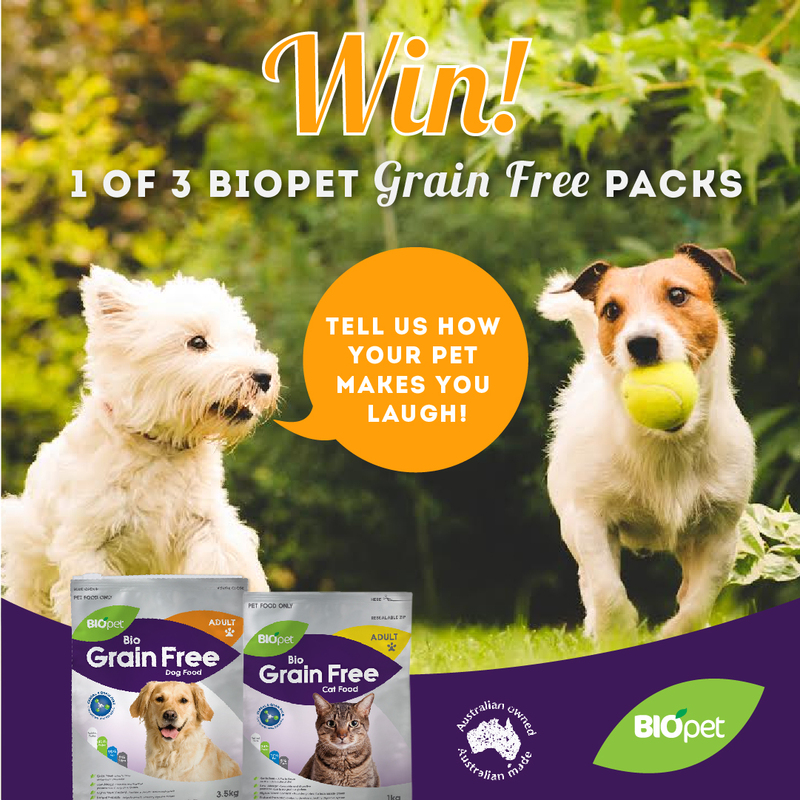 Prizes: winner will receive BIOpet Supremium dog food (10.5kg), the second winner will receive BIOpet Grain Free cat food (6kg). 2 prizes to win. Prize description based on average consumption of a medium-sized adult dog or cat. Prize cannot be exchanged for cash. To enter, participants must post a photo, video or write in 25 words or less, a time they caught their pet being mischievous/naughty. Entries must be posted with the hashtag #BIOpetPromo. Judges' decision is final and no correspondence will be entered into. 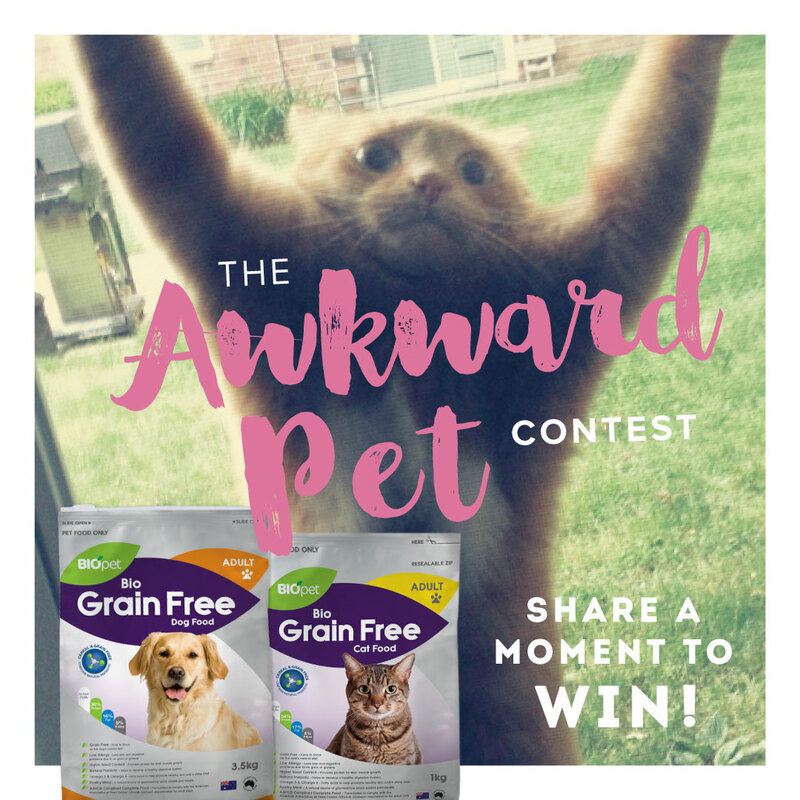 Share a time when you pet has made you laugh for a chance to win your choice of a month's worth of BIOpet Grain Free cat food or dog food! 3 to be won. Entries via Facebook only. Terms and conditions: This is a game of skill. Chance plays no part in determining the winner. Open to Australian residents only. Starts 9am 5/6/16 and ends 11:59pm 12/6/16. Winners announced 4pm 14/5/16. 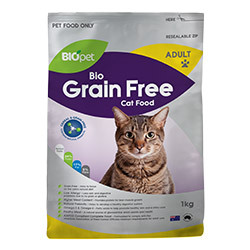 Prize: winner’s choice of 10.5kg BIOpet Grain Free dog food or 6kg BIOpet Grain Free cat food. 3 prizes to win. Prize description based on average consumption of a medium-sized adult dog or cat. Prize cannot be exchanged for cash. To enter, participants must post a photo, video or write in 25 words or less, a time when their pets made them laugh. Entries must be posted with the hashtag #BIOpetPromo. Judges' decision is final and no correspondence will be entered into. Share your moment on Facebook or Instagram for a chance to win your choice of a month's worth of BIOpet Grain Free cat food or dog food! 3 to be won. This is a game of skill. Chance plays no part in determining the winner. Open to Australian residents only. Starts 5pm 28/4/16 and ends 11:59pm 9/5/16. Winners announced 4pm 10/5/16. 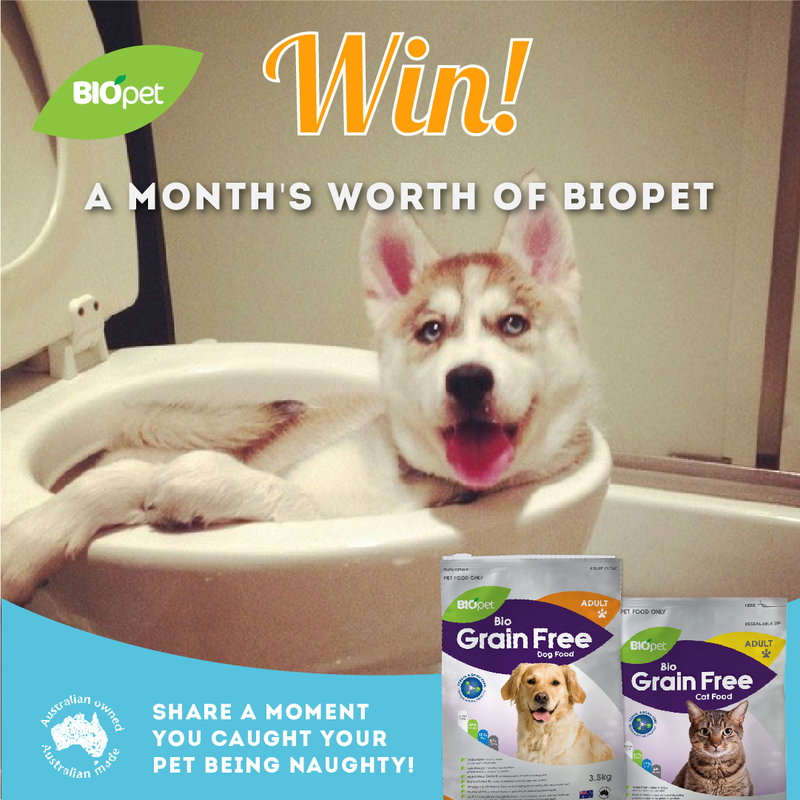 Prize: winner’s choice of 10.5kg BIOpet Grain Free dog food or 6kg BIOpet Grain Free cat food. 3 prizes to win. Prize description based on average consumption of a medium-sized adult dog or cat. Prize cannot be exchanged for cash. To enter, participants must post a photo, video or write in 25 words or less, a time when their pet got up to an awkward moment. Entries must be posted with the hashtag #BIOpetPromo. Judges' decision is final and no correspondence will be entered into. This is a game of skill. Chance plays no part in determining the winner. Open to Australian residents only. Starts 5pm 24/3/16 and ends 11:59pm 30/3/16. Winners announced 4pm 31/3/16. Prize: two x 3kg BIOpet Supremium dog food. 3 to win. Prize description based on average consumption of a medium-sized adult dog. Prize cannot be exchanged for cash. To enter, participants must post a photo of their dog with the hashtag #BIOpetPromo showing us their dog getting into the Easter spirit. Judges' decision is final and no correspondence will be entered into. This is a game of skill. Chance plays no part in determining the winner. Open to Australian residents only. Starts 5pm 12/2/16 and ends 11:59pm 16/2/16. Winners announced 4pm 17/2/16. Prize: one x 3.5kg BIOpet Vegan Adult dog food. 6 to win. Prize description based on average consumption of a medium-sized adult dog. Prize cannot be exchanged for cash. To enter, participants must post a photo of their dog with the hashtag #BIOpetPromo showing us why their dog fills their life with love. Judges' decision is final and no correspondence will be entered into. 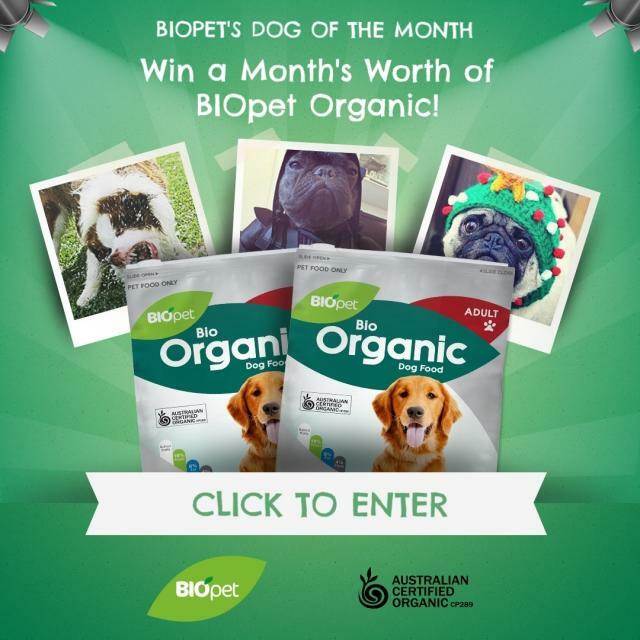 Show us why your dog is BIOpet's Dog of the Month! Follow us on Instagram or Facebook and post a fun pic with hashtags #BIOpet and #DogOfTheMonth and you could WIN a month's worth of BIOpet Organic! This is a game of skill. Chance plays no part in determining the winner. Open to Australian residents only. Starts 11am (AEDT) 7/12/15 and ends 11:59pm 10/12/15. Winner announced 4pm 11/12/15. Prize: one x 10.5kg BIOpet Organic Adult dog food. 'Month's Worth of BIOpet Organic' based on average consumption of a medium-sized adult dog. Prize cannot be exchanged for cash. To enter, participants must post an original photo of their dog with hashtags #BIOpet and #DogOfTheMonth. Judges' decision is final and no correspondence will be entered into. We are launching our NEW Grain Free Cat Food this week. Check out the product profile at 'OUR BRANDS'. BIOpet Sponsored Event - The Medowie and District All Breeds Kennel Club. BIOpet is pleased to be the exclusive dry dog food sponsor at this weekends (1-3-14) all breed show; The Medowie and District All Breeds Kennel Club. BIOpet has provided over 80 bags to be given away to participants. We look forward to introducing our new range of BIOpet to the show dog community. If you are in the area please feel free to visit the BIOpet tent, where we will have plenty of product info and samples for the day! We are very excited to have been able to donate our new #BIOpet Grain Free Dog Food to the 2014 Bars March - VIP Launch party, Cafe del Mar, Cockle Bay - Sydney. We are pleased to say, that our NEW webiste was launched today. You will find all of our new products (Yoghurt & Grain Free) listed. Have a look & feel free to provide feedback.